On May 30, the national COSTA program 'corporates and startups' collaboration will be completed. 15 corporates with partners have shared their results and tools. Program manager COSTA Fancy van de Vorst and Thomas Grosfeld VNO-NCW MKB NL and CVN sound the gong and open trading. One of the core goals of Startup Delta is creating One Single Hub by connecting the Dutch startup ecosystem. COSTA (COrporates & STArtups) pursues this goal by connecting corporates and startups and strengthening their collaboration. In this cooperation, the corporates together try to answer questions as: How should a corporate stimulate innovation in cooperation with startups? How does one facilitate the relationship between a corporate and a startup? With the launch of ACTIAM Verantwoord Index Aandelenfonds Opkomende Landen, the responsible fund- and asset manager ACTIAM is celebrating the launch of its fifth responsible index equity fund for the retail market. 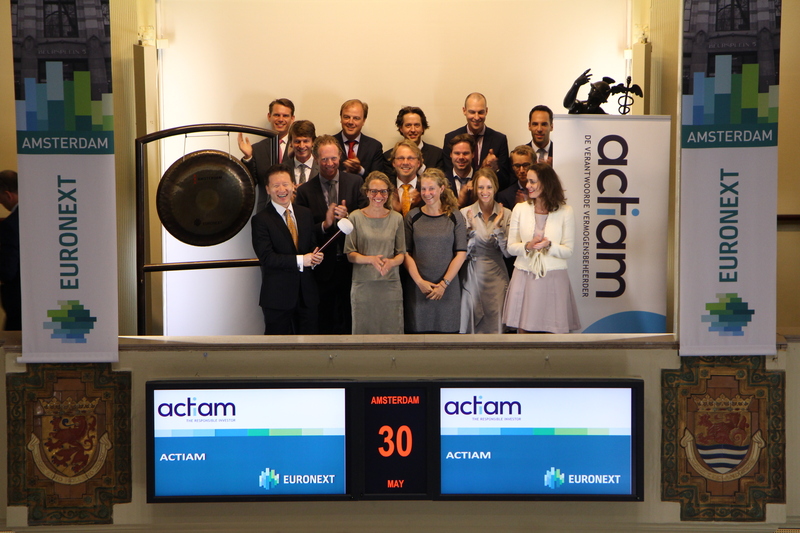 ACTIAM’s responsible index equity funds are a welcome addition to the Dutch retail fund market: we combine a responsible investment policy with transparency and cost efficiency. The funds are available via Euronext Amsterdam or via the funds’ register. ACTIAM is the leading responsible fund and asset manager, with € 54.6 billion in assets under management (December 31st 2016). They offer a comprehensive range of investment funds and investment solutions that extends from index investing all the way to impact investing. 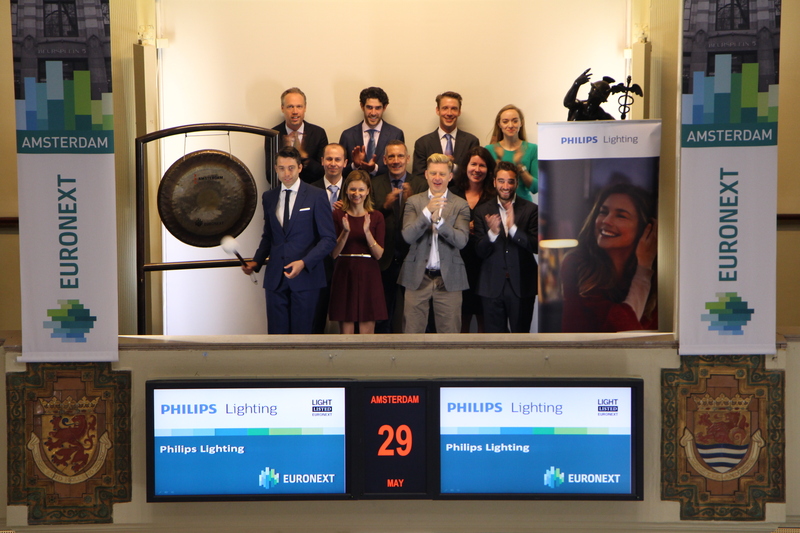 Philips Lighting (ticker symbol: LIGHT), a global leader in lighting, is marking the one-year anniversary of its successful listing at Euronext Amsterdam in 2016. In the course of the past year, the company has celebrated a number of milestones, including the introduction of the Dubai Lamp, the world's most energy efficient LED bulb commercially available, the installation of one of the world's largest connected street lighting systems in Jakarta, and a commitment to ambitious sustainability targets as part of its Brighter Lives, Better World program. The company - the industry leader in conventional, LED, and connected lighting - opens trading at the Amsterdam exchange with a group of employees who joined the company over the past year. They are a few of the new faces at the 126 year old company, who are working together to unlock the extraordinary potential of light for Brighter Lives and a Better World. KLM (ticker symbol: AF) sounds the gong after they have won several Awards again recently. They received no less than six Webby Awards with its anniversary edition of the digital KLM magazine, iFly KLM 50. The 21st Annual Webby Awards, also known as the Oscars of the Internet, were awarded in New York recently. Not only did iFly KLM 50 come in at the top of the Tourism & Leisure category within the Advertising Media & PR category, but the Best User Experience Webby was also secured within this category. What’s more, an award was also secured within the Best Visual Design (Aesthetic) category within the Websites category. KLM succeeded in winning both the public prize and the jury prize within these subcategories. Earlier this month, KLM also won five SpinAwards including the Grand SpinAward for 2017, two bronze Lamps at the 50th edition of the ADCN Awards, and a Customer Centric DNA Award. Roparun will start Saturday 3 June 2017 in Hamburg and Paris and finishes Whit Monday in Rotterdam. Director of Roparun Foundation, Theo Quaijtaal sounds the gong accompanied by participants of team Unilever. The Roparun is a relay race of more than 500 kilometers from Paris and Hamburg to Rotterdam, in which people work as a team to give a combined sports performance in order to raise money for people who suffer from cancer. This year’s 26th edition has 322 teams participating in this challenge. Besides the physical challenge, the team must also make an effort to raise money for the cause. Teams do this by organizing various activities. The three teams who raise the most money and the six teams who win for their running speed are honored during the final celebration of the Roparun, which takes place a few weeks after the finish. Over the past twenty-five editions of the Roparun, more than seventy-two million Euro has been raised. ENGIE Nederland (ticker symbol: ENGI), energy supplier and market leader in the provision of technical services, is the main sponsor of EYE Filmmuseum. Both organizations distinguish themselves through innovation, creativity and social commitment. 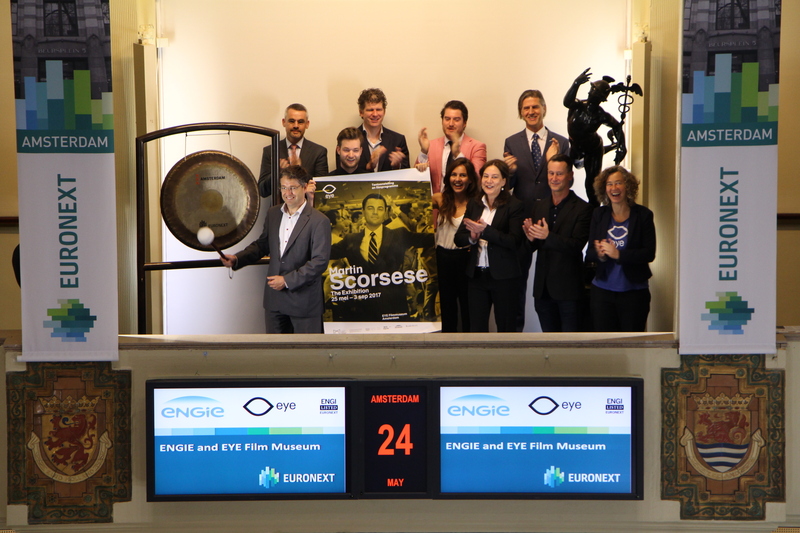 ENGIE and EYE visit the Amsterdam exchange to sound the gong for Martin Scorsese - The Exhibition, and EYE is able to present this major exhibition thanks to the support of ENGIE. In the coming period, ENGIE and EYE Filmmuseum will work together on the sustainable development of the Overhoeks area and environs. In addition, ENGIE wants to help make the EYE museum building on IJpromenade in Overhoeks even more sustainable. EYE has consciously chosen for sustainability, and that dovetails perfectly with the vision of ENGIE. That’s because ENGIE delivers smart technical energy solutions that make use of visible and invisible sources of energy to create neighborhoods where almost all energy is generated sustainably. ENGIE values the innovative efforts of EYE in managing, preserving and digitizing film history, and supports the museum’s efforts in the field of sustainable cultural preservation. ENGIE can work with EYE in a new way: that’s their key to success in sustainable development, and they’re glad to sound the gong for this new venture. Arjan Schrijver, dairy farmer and customer of ForFarmers (ticker symbol: FFARM), sounds the gong. The occasion is this year’s edition of the annual Agroscoopbokalen (Agroscoop goblets). ForFarmers awards these goblets to farmers who have performed exceptionally in their industry within their operations. Agroscoop is a digital monitoring program that effectively guides ForFarmers’ farmers organizations. By working intensively with customer, ForFarmers offers them concrete results: better returns, healthier livestock, and higher efficiency. In this manner, ForFarmers contributes to economically viable and sustainable food production. ForFarmers is an internationally operating company active in the area of conventional and organic feed solutions for livestock. With sales of approximately 9.1 million tons of feed annually, ForFarmers is a market leader in Europe. With its products, ForFarmers offers customers additional knowledge and advice in the areas of feed, animal keeping and business development. 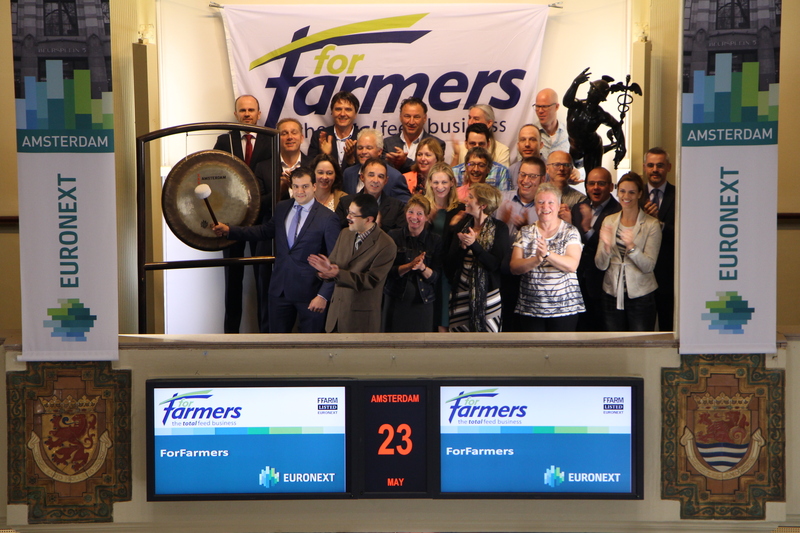 ForFarmers has been listed to the Amsterdam exchange of Euronext since May 2016. 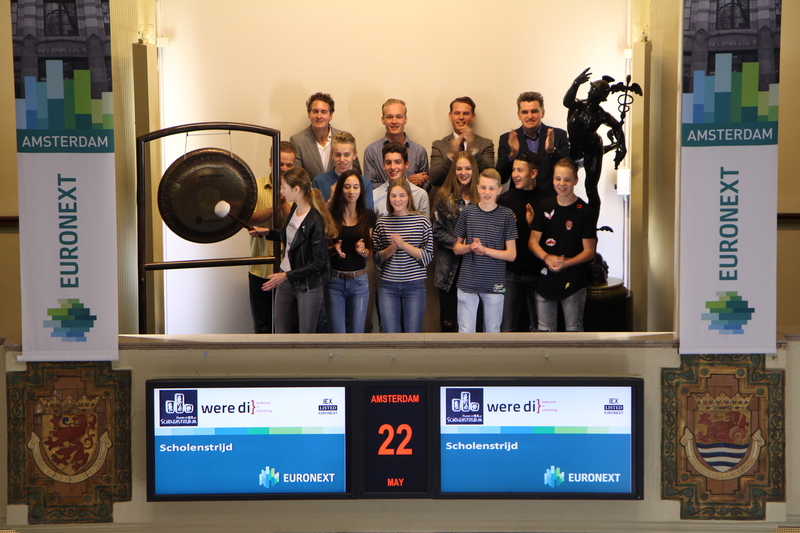 Students from the Atheneum 3-class of Community school Were di from Valkenswaard sound the gong of the Amsterdam exchange as winners of investment competition Scholenstrijd. Were di won the prize for the best return at the end of 2016. Scholenstrijd is an online investment competition for HAVO and VWO high school students and teachers of economics. Scholenstrijd is a serious game and aims to increase the financial and economic knowledge of students. Students and teachers can use the competition for free throughout the year. Twice a year a prize game is organized - the best class based on return and the best class based on risk return receives a prize. The competition has been supported by Stichting Capital Amsterdam since the beginning. In addition, Kempen & Co, Van Lanschot, BinckBank, STOER, Stichting Goede Doelen NH 1816 and De Nederlandsche Bank are sponsors of Scholenstrijd. The winners of the 11th Norh-Holland SME-awards (Ondernemingsverkiezing Noord-Holland/ OVNH) open trading at Beursplein 5. 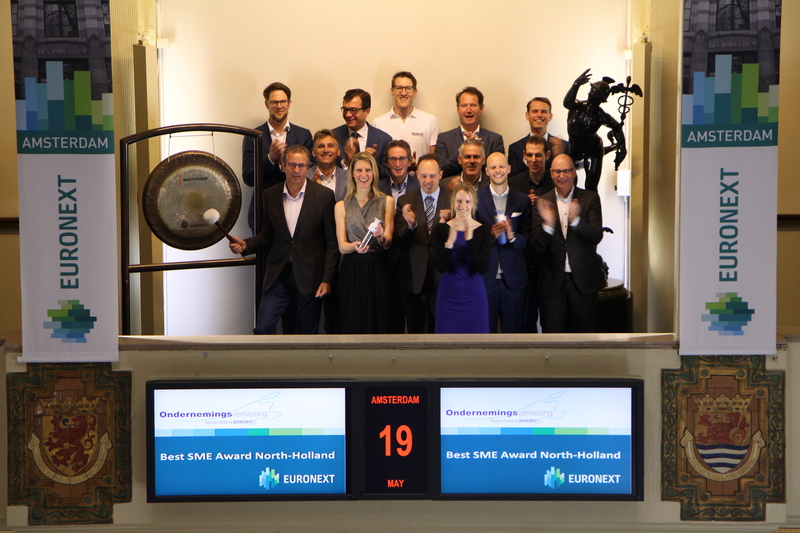 The winners in the categories of Large SMEs, Medium SMEs, Small SMEs, and Public Choice award visit the Amsterdam exchange of Euronext and are accompanied by MKB-Amsterdam director, Fabian Nagtzaam. All OVNH partners participate in the prize package, which will be awarded to the winners next to the media attention and the title. Partners and sponsors are: Randstad and Province of North-Holland, ABN AMRO, Delta Lloyd, MKB Noord-Holland, Holland Media Combinatie, RSM, NH, Starletti and Landgoed Duin & Kruidberg. 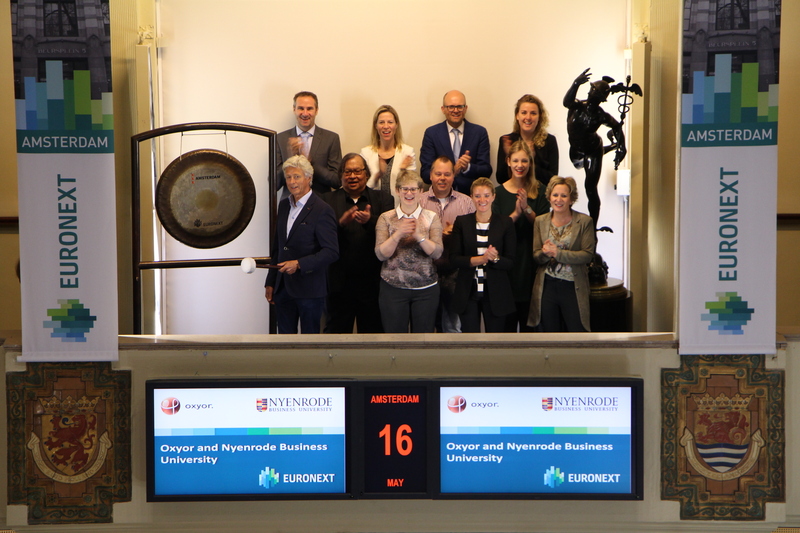 In celebration of its five–year listing anniversary on the Amsterdam exchange, Core Laboraties (ticker symbol: CLB) sounds the gong, at the opening gong ceremony signaling the start of the trading day. This ceremony will coincide with Core Lab’s 2017 annual shareholder meeting to be held in Amsterdam later in the day. David Demshur, CEO Core Lab, sounds the gong. 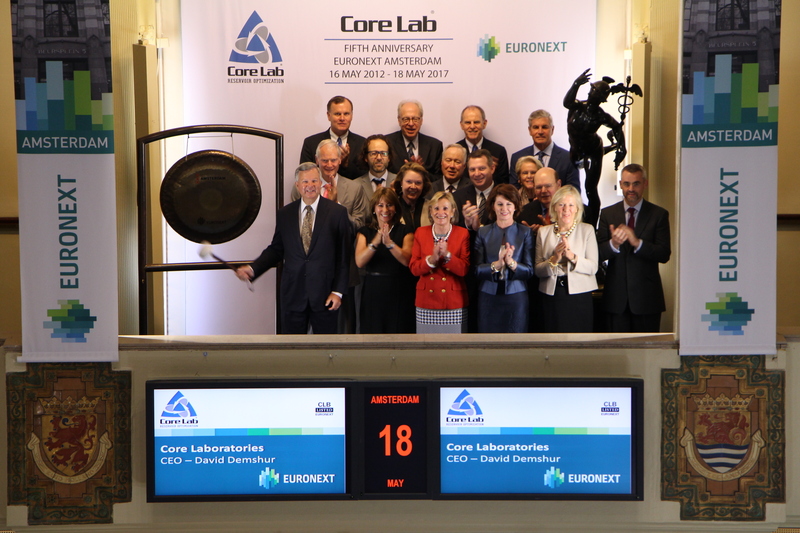 When Core Laboratories (Core Lab) announced its intentions on 18 April 2012 that it planned to dual list its shares on Euronext Amsterdam, the company’s European institutional investor share ownership was just 5%; today the European ownership of Core Lab has increased to almost 14%. The company attributes this dramatic increase to shareholder focus on companies that generate high levels of Return on Invested Capital and free cash flow. 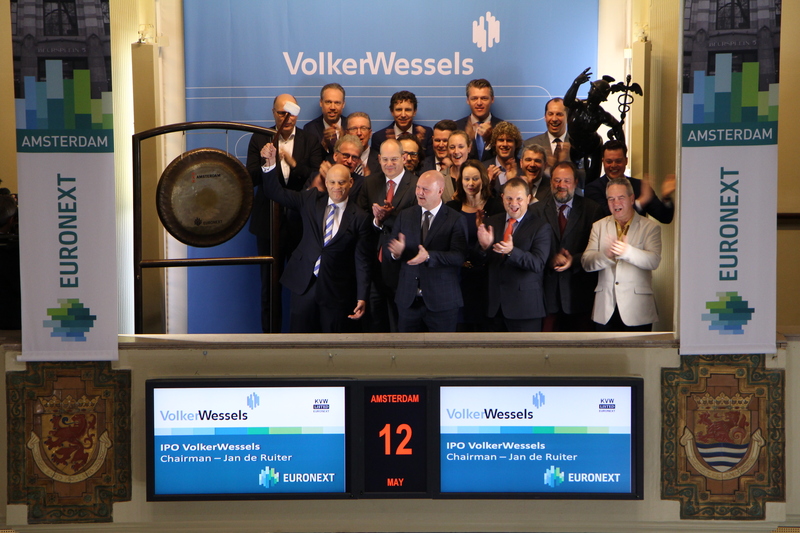 The dual listing on Euronext Amsterdam has made this very successful outcome possible. 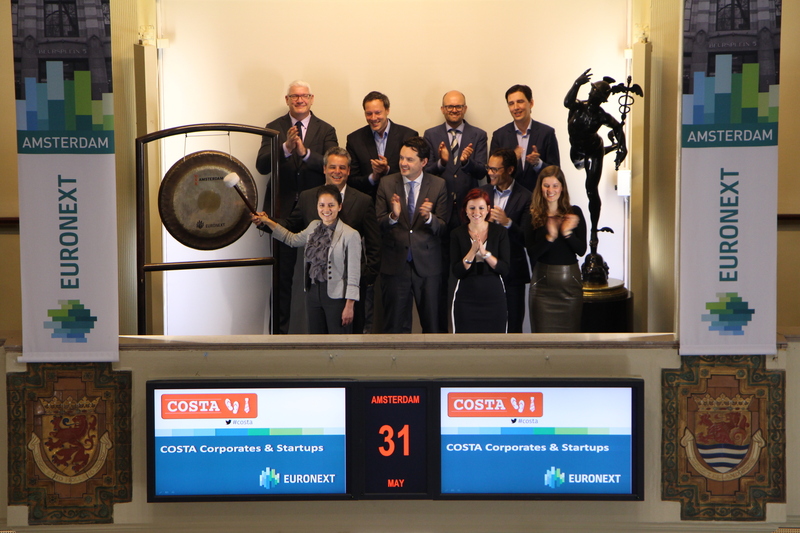 Core Lab is proud to have its dual listing on Euronext Amsterdam, especially given its historical ties to the Netherlands, its large operational footprint in the Netherlands with employees and laboratories in Rotterdam, Vlaardingen and Amsterdam, and its client base throughout Europe. Core Lab is a leading provider of proprietary and patented reservoir description and production enhancement services used to optimize petroleum reservoir performance. The company has over 70 offices in more than 50 countries and is located in every major oil-producing region in the world. 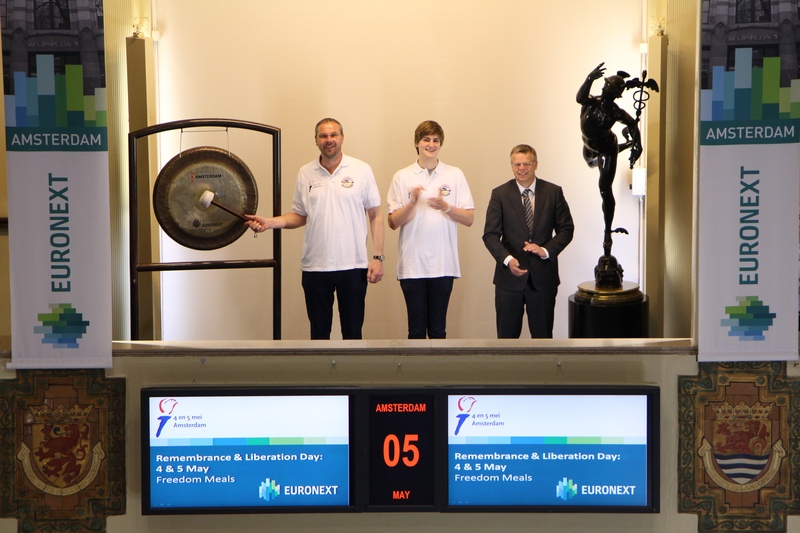 Euronext opened the 13th edition of the Knowledge for Growth Conference in Ghent with a bell ceremony in presence of Maggie De Block, Minister of Social Affairs and Health. Knowledge for Growth is a European life sciences conference organized by flanders.bio. Participants include decision makers from biotech, pharma and medtech as well as investors, universities, leading research institutes, policymakers and competence providers. In 2016, a record number of 1.250 attendees from 16 countries attended. This year, the conference's programme featured a focus on the global life sciences’ landscape, B2B Partnering powered by EBD Group’s partneringLITE, a trade fair with 100 exhibitors and a scientific poster area. 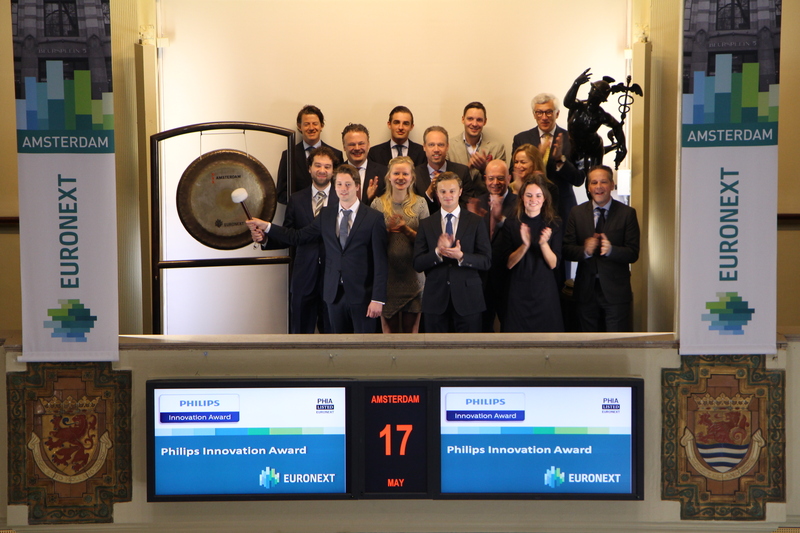 The Phillips Innovation award is the largest student-entrepreneur award in The Netherlands. It was first organized 12 years ago and is organized for students, by students. The Philips Innovation Award has become a platform where each participant can profit from. Participants receive personal feedback, practice important skills, receive coaching and build a network. The 30 best participants showed their start-up to investors and entrepreneurs, while receiving feedback on their pitch by a professional jury during the semi-finals. The best 8 start-ups made it to the final, where over 800 visitors experienced an inspiring evening with interesting guest speakers and - of course - high quality innovations. GBM Works won the Innovator League and was rewarded with a price worth €50.000. Levels Diagnostics won the Rough Diamond League and was rewarded with a price worth €10.000. 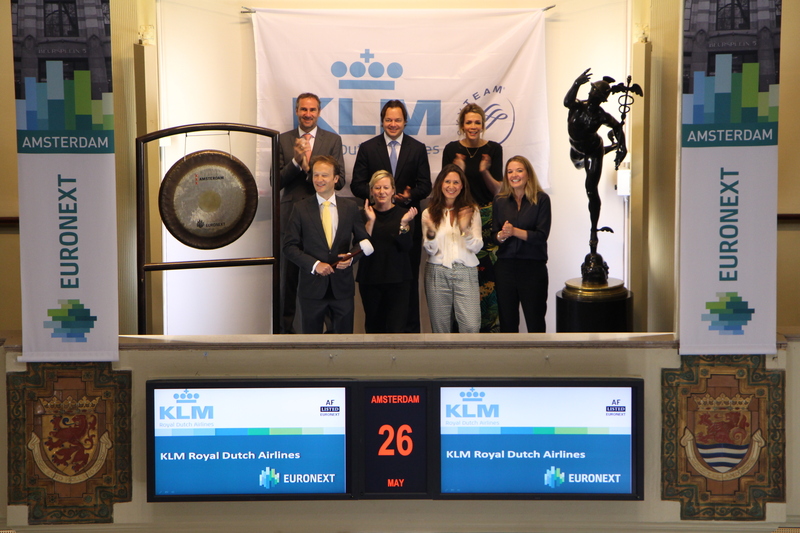 To celebrate the 15th listing anniversary of Melexis and the company’s spectacular growth on Euronext Brussels, Karen Van Griensven, CFO of Melexis, rang the Euronext bell to open the markets. Melexis is one of the five world leaders in automotive semiconductor sensors and a leading player in integrated circuits for motor driving, car networking and wireless communication. Frits Oppel, graduate of the Nyenrode Private Investor Program, opens trading at the Amsterdam exchange. Participants in the Private Investor Program actively learn to analyze and manage their own investment portfolios according to the latest insights in the field of investing. They will be assisted by top experts in every step of the way, ensuring that they make the right investment decisions. After successful completion of this program, the participants are able to independently take control of their own portfolio and are, at least, at the same level as a professional investor with several years of experience. Nyenrode Business Universiteit’s mission is: ‘Serving society by shaping responsible leaders’. Nyenrode is a small-scale private university, founded in 1946 for and by business, with an international orientation. Nyenrode offers students and participants a combination of sound theoretical framework, practical relevance and personal development. Thanks to this combination, they develop sustainable added value for themselves, for their company and for society. 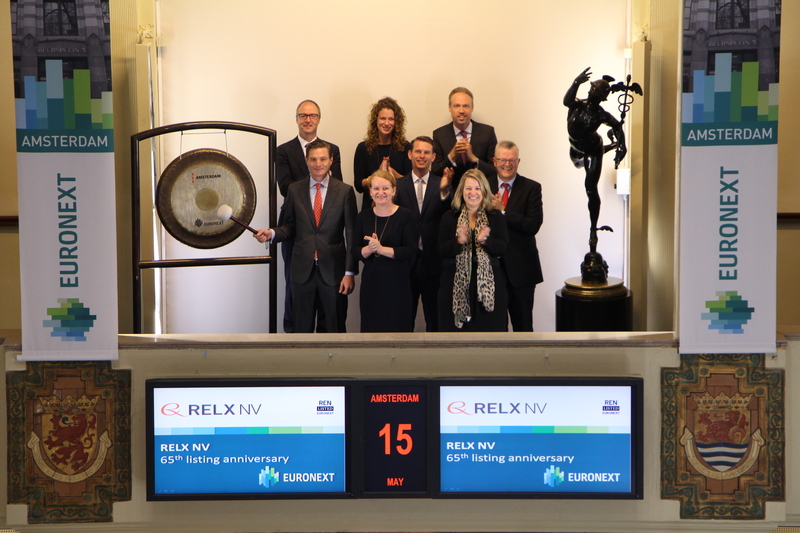 The first share for N.V. Uitgeversmaatschappij Elsevier, the predecessor for RELX N.V. (ticker symbol: REN), was traded at Euronext Amsterdam 65 years ago. Over the years the company has transformed to become a global provider of information and analytics for professional and business customers across industries, enabling customers to make better decisions, to get better results and to be more productive. Alexander van Boetzelaer has the pleasure of opening trading in his capacity as Head of House of RELX Nederland and EVP Strategy Elsevier B.V.
RELX Group serves customers in more than 180 countries and has offices in about 40 countries. It employs approximately 30,000 people of whom almost half are in North America. RELX N.V. is an Amsterdam listed holding company which owns 47.1% of RELX Group. RELX PLC is a London listed holding company and owns 52.9% of RELX Group. Total market cap is approximately €37 billion. Euronext launches Euronext Fund Service Paris, an innovative model to facilitate investment in funds across the globe. Euronext Fund Service Paris is an innovative and complementary solution for investing in open-end funds (UCITS1 and AIF2) registered or passported in France. It offers institutional and retail investors a simplified, automated cost-efficient subscription/redemption service to invest in funds through their brokers. Euronext Fund Service has been launched on 15 May 2017, starting with AXA IM, Ecofi Investissements, La Française Investment Solutions, Longchamp Asset Management, Natixis AM and OFI AM funds. VolkerWessels is a leading integrated and diversified construction group with a “think global, act local” mind-set. They operate primarily in the Netherlands, the United Kingdom, North America and Germany and has leading positions in the markets it operates in. In the Netherlands, VolkerWessels is the market leader by revenue in construction & real estate development, infrastructure and energy & telecom infrastructure. VolkerWessels has an ecosystem of entrepreneurs and more than 120 local operating companies, with approximately 16,000 skilled employees. Their operating model combines a local sales and client focus with a centralised control and support structure at divisional level that optimises scale and expertise across its operating companies. Raphaël Gorgé, CEO & Chairman of Prodways, opens the trading day in Paris. Net sales are distributed geographically as follows: France (42.1%), Europe (32.8%), North America (18.9%) and other (6.2%). The Dutch Payment & Exchange Company (NBWM) sounds the gong for international expansion. They do this accompanied by Farosol and Dutch Credit Brokers. Farosol and Dutch Credit Brokers have been partners of NBWM for a long time, they offer a broad range of services within Credit Management, focused on Credit Insurance. 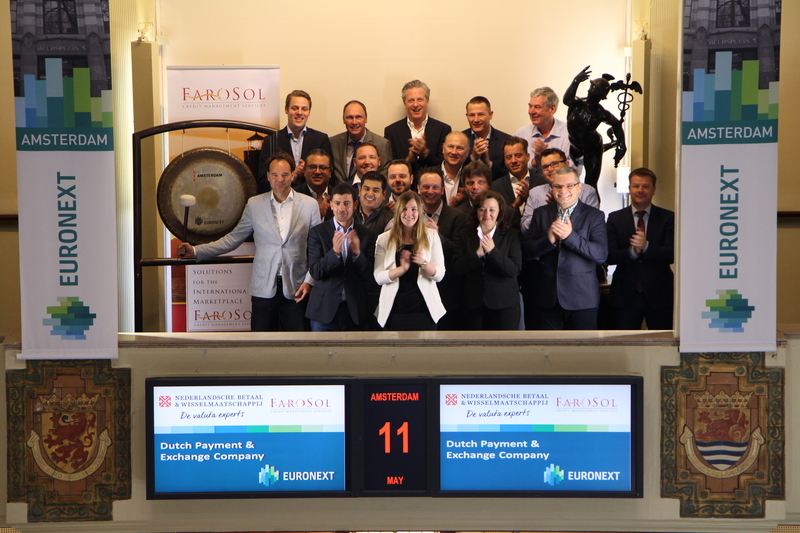 Farosol and Dutch Credit Brokers help NBWM grow internationally by providing a vast network. State Street Global Advisors (SSGA) opens the trading day to celebrate the successful listing of 10 Global Sector SPDR ETFs on Euronext Amsterdam one year on. SPDR ETFs has an extensive track record in this area and offers the broadest suite of Sector ETFs in the market, covering Europe, US and Global sectors. Philippe Roset, head of SPDR ETFs Netherlands, comments: “Sector ETFs have seen a marked increase in popularity amongst investors, with Technology and Energy seeing the greatest level of investor interest over the last 12 months. Inspiring Fifty recently revealed the names of fifty women who were nominated by a group of high profile judges as the most inspiring women in Dutch technology. The judges have recognized the exceptional achievements and the great contributions of these women but more importantly; they are considered role models that can inspire the next generation of women and girls in technology. Jalila Essaidi, Director Inspidere, sounds the gong together with Neelie Kroes, Member of the Board at Uber. Inspiring Fifty is a not-for-profit organization established in 2013 by the two successful Dutch entrepreneurs Janneke Niessen and Joelle Frijters, co-founders at Improve Digital. They aim to improve the gender balance in the tech sector. The launch of Inspiring Fifty Netherlands follows the European list, that was released in March. 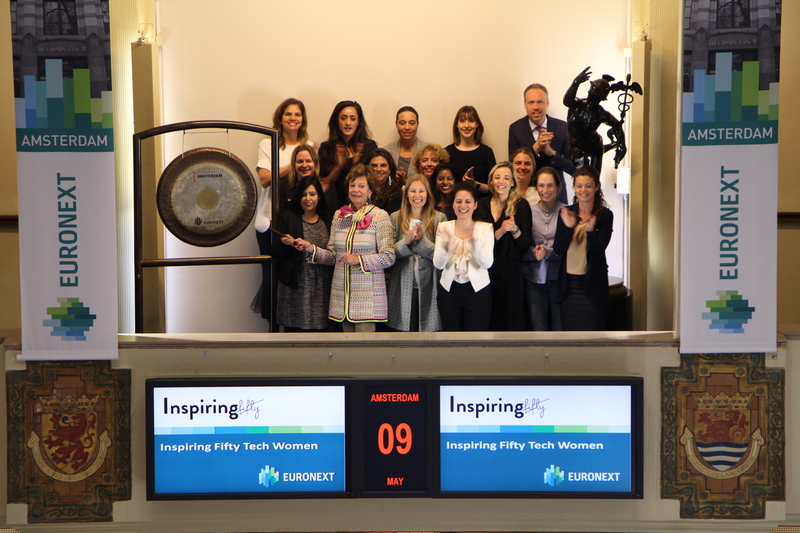 Later this year Inspiring Fifty will also announce the Nordics, UK, DACH and France top 50 women in technology. Moreover, the not-for profit organization will continue to inspire in other countries, for the first time now also outside Europe. In cooperation with the Dutch Embassy Inspiring Fifty South Africa will be launched. 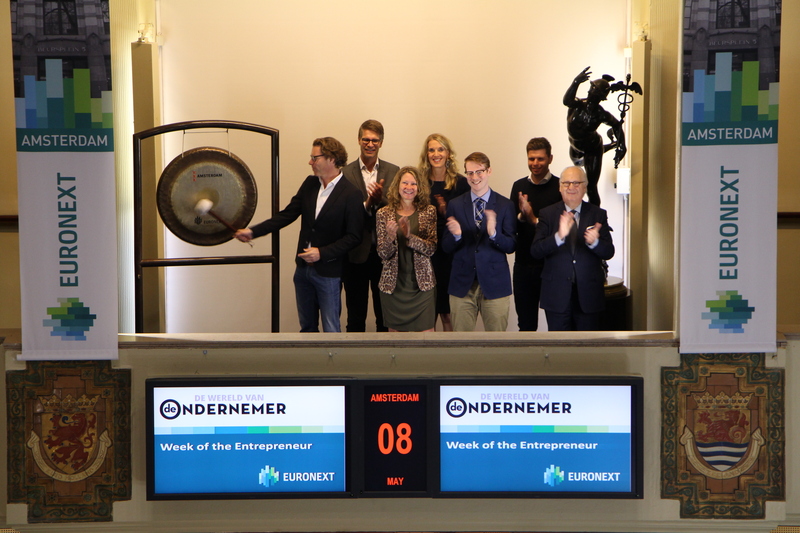 Trading is opened on the occasion of Week of the Entrepreneur (Week van de Ondernemer). The event takes place for the 20th time in the Jaarbeurs in Utrecht. Yet again around 5,000 entrepreneurs are expected to attend this year. The gong is sounded by Gerard van den Broek, Director of De Ondernemer. This year's edition of the Week of the Entrepreneur, the oldest and largest live entrepreneurial event in the Netherland, is fully focused on growth. Many successful entrepreneurs and top speakers are present to share their knowledge and experience with the attending entrepreneurs. The Week of the Entrepreneur is part of the 'Wereld van de Ondernemer' (World of the Entrepreneur,) a cross-media platform that consists of a quarterly magazine, a weekly newspaper page, a weekly newsletter, a website and events, and aims to stimulate entrepreneurship by inspiring and informing entrepreneurs. This platform is part of De Persgroep. 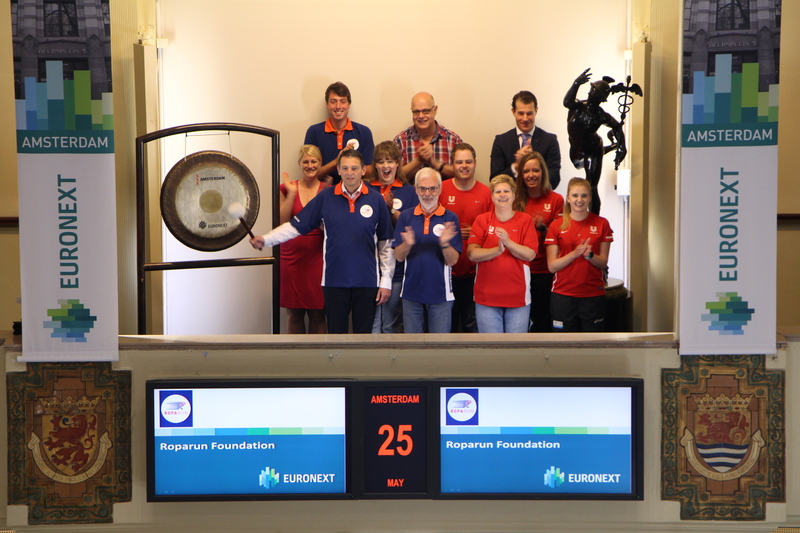 The Amsterdam Committee 4 and 5 May visits the Amsterdam exchange and opens trading by sounding the gong. The National Committee takes care of organising the national activities on 4 and 5 May, including the coordination of the Liberation Festivals, and it runs educational projects, develops mass media campaigns and gathers knowledge and makes it available to others, for example about war monuments and commemorations throughout the country. In this connection, the National Committee works together with numerous other parties on the local, provincial and national levels. 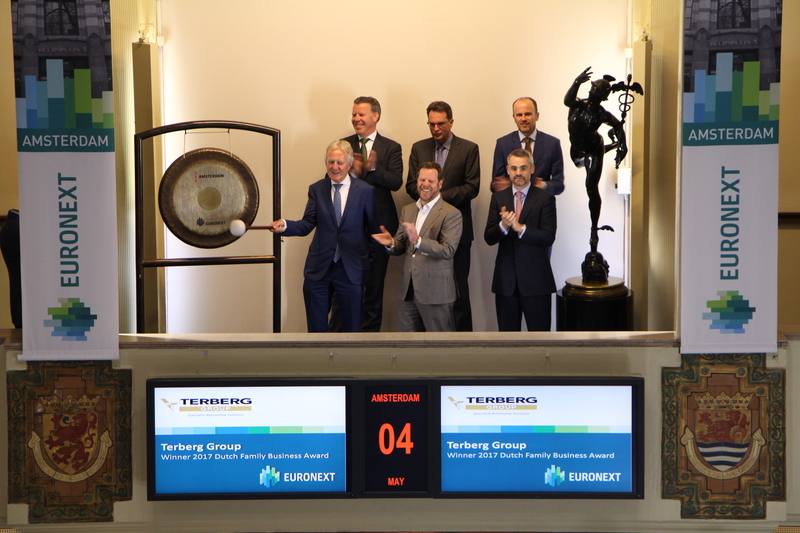 Terberg Group B.V. was recently announced winner of the 2017 Dutch Family Businesses Award during a ceremony in the Nieuwe Kerk in The Hague, the Netherlands. This prestigious award was presented by Her Royal Highness Princess Laurentien of the Netherlands. George Terberg, Chairman of the board, sounds the gong to celebrate the company’s prize. From the initial 500 family businesses, 10 were nominated, and then 4 finalists were selected: Brabantia, Koninklijke A-Ware Food Group, Koninklijke Zeelandia, and Terberg Group. George Terberg, Chairman of the Board: "Who would have thought that our village forge, set up in 1869, would develop into the Dutch Family Business of the Year. We are incredibly proud of this and consider it the icing on the cake that underlines the hard work undertaken by our family and employees every day to operate successfully throughout the world". Better Options LLP, trading company based in the Amsterdam exchange building, opens trading in the company of Giving Back Foundation. Better Options invited the Amsterdam pupils and mentors of Giving Back Foundation for a day at the exchange. Giving Back Foundation is committed to a diverse society in which everyone has an equal chance to develop his or her talent. Giving Back focuses on a broad group of talented pupils and students who have the potential to play a successful role in society. Giving Back offers these youngsters a challenging program aimed at both personal and professional development. The program consists of workshops and events, plus a mentoring program. Giving Back offers programs for pupils, students and young professionals.